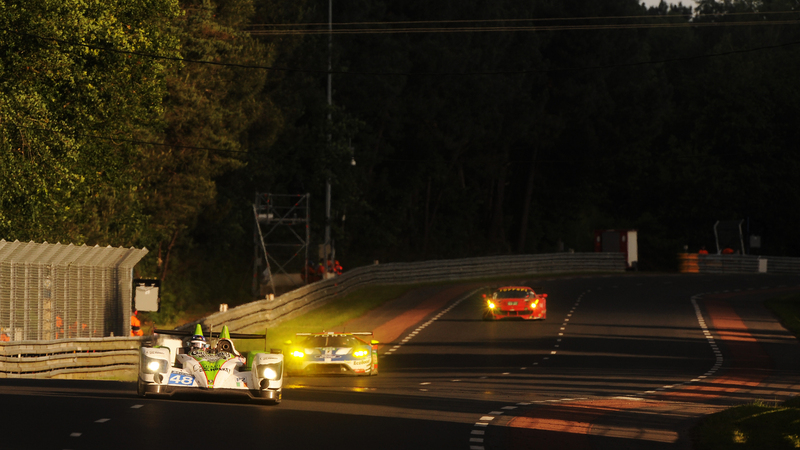 Murphy Prototypes came to Le Mans in 2016 for their fifth consecutive challenge on the 24 Hours at La Sarthe. Team Principal, Greg Murphy, centred upon the established partnership of Marc Goossens, Jeroen Bleekemolen and Ben Keating – three drivers who already race together regularly with ViperExchange.com SRT Viper GT3 in the USA. Not only does the trio have a deep seated understanding of each other, but Goossens and Bleekemolen have a total of 23 Le Mans starts between them. Marc Goossens made his debut at La Sarthe in 1996, and has contested the 24 Hours from WSC and LM prototypes to GT. Bleekemolen hasn’t missed a start at Le Mans in ten years, and took a class win in 2008. The Murphy Prototypes Nissan-powered Oreca 03 open-topped LMP2 prototype has been part of Le Mans for the last five years, with a proven track record for speed and reliability. The car came with the colourful backing and distinctive livery of Gas Monkey Energy Drink and “Cruisin’ with the Monkey”, the brainchild of Gas Monkey Garage founder and classic car enthusiast Richard Rawlings. This was topped off by branding for Ben Keating’s own ViperExchange dealership. . The weather for qualifying and practice was very mixed. Few can have remembered a week at Le Mans when it rained so hard. In practice and qualifying many teams, Murphy Prototypes included, were simply denied the opportunity to perfect an optimum set-up for the track. Having to start the race behind the safety car, in an open-topped car beneath a torrential downpour, became a critical factor in the team’s fortunes. It was not until fifty minutes after the start that racing finally got under way, and Jeroen Bleekemolen made a strong impression for Murphy Prototypes. From 20th in LMP2 on the grid, the Dutch driver had the #48 Oreca through to a peak of 11th early into the second hour. A determined strategy of smooth, consistent lapping, keeping free of trouble, was paying dividends, but four hours into the race the full impact of the weather hit home. Water had worked deep into the car’s electronics, and the first casualty was the visual display, followed swiftly by the dashboard itself. Elusive electronic faults are the hardest to isolate and the only solution was to replace vast tracts of wiring and circuitry. By the fourth hour, the #48 was classified 57th out of 60 starters. That heralded an heroic fight-back, through the night and into the early hours of Sunday, that saw Ben Keating, Jeroen Bleekemolen and Marc Goossens driving with skill and determination, dragging the #48 back up through the ranks. Just before ten on Sunday morning, Murphy Prototypes moved into 24th overall and a great result looked possible. However, with three hours to go, the car lost power at the Ford Chicane before the start-finish straight. Marc had to turn across from the chicane onto the grass to make the entrance to the pit. Once the car was into the garage, the team had to work hard to fix the problem. After another 30 minute pitstop, Marc was able to get back out and climb a few positions before handing over to Ben Keating for the final stint to finish the race. Ben saw out the rest of the race with a solid stint, crossing the line in P15 in the LMP2 class, and P34 overall. Considering the car had been practically last after 3 hours, the crew and the drivers really pulled together as a team to deliver a result. This is the final year at Le Mans for the Murphy Prototypes Oreca-Nissan 03. The LMP2 regulations change from next year, so Team Principal, Greg Murphy is looking forward to a new package and a new challenge for Le Mans in 2017. “I came to this year’s Le Mans wanting to do well, but I now really understand how special it is to finish. This year is the first time that finishers do a full lap at the completion of the race, and to see the hundreds of marshals and support crews out there waving their flags was truly special. In the open top car, you really engage with the fans, clapping them and giving them thumbs up. Amazing, amazing – like nothing I have ever experienced’.